Home > Blog > What Are Cooling Towers? Prior to the dawn of the Industrial Revolution, most businesses didn’t have to worry about cooling their workplaces. It was not until the latter part of the 1890’s to the early 1900’s that the need for a reliable, dependable and consistent means to cool workplaces became of paramount importance to management. While older workplaces prior to the height of the Industrial Revolution depended solely on ventilation as a means for cooling, the introduction of large-scale factories and refineries, which often had their fair share of large machinery, necessitated a better approach to cooling. While there have been a number of proposed cooling methods over time that were supposed to ‘guarantee’ efficient cooling for factories and refineries, all of these fell short of the expectations. It was not until the latter part of the 19th century that a revolutionary way to help that would provide ample ventilation and cooling to refineries and factories was developed. 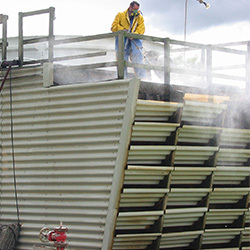 With the growing demand for improved working conditions and better chances of manipulating the environment to increase functionality for its machinery, industries found the solution to these problems – the invention of the cooling tower. Cooling towers were initially developed during the 19th century and was inspired in part by the science of condensers, which were employed by steam engines. The earliest cooling tower followed the simple science of condensers and was initially fashioned from a variety of local materials. The earliest description of these unique structures was that they were free-standing edifices or otherwise constructed atop the rooftops of buildings. These were made with wood or brick in order to construct a shell or foundation frame, although some examples were even designed using light-metal plating such as galvanized sheeting. Another type of cooling tower featured automated fans that helped to circulate cool air from the outside and release the trapped heat from within. Today, the science behind the humble cooling tower has advanced significantly. Modern cooling towers are now fitted with high cooling performance modular block fill pack, low drift loss modular drift eliminators, and sunlight reducing air intake louvres with anti-splash functionality. For more information on cooling towers and how they can be designed to increase cooling using less energy visit www.coolclean.com.au.